It was lovely to be out and about this weekend in the much-missed sunshine. 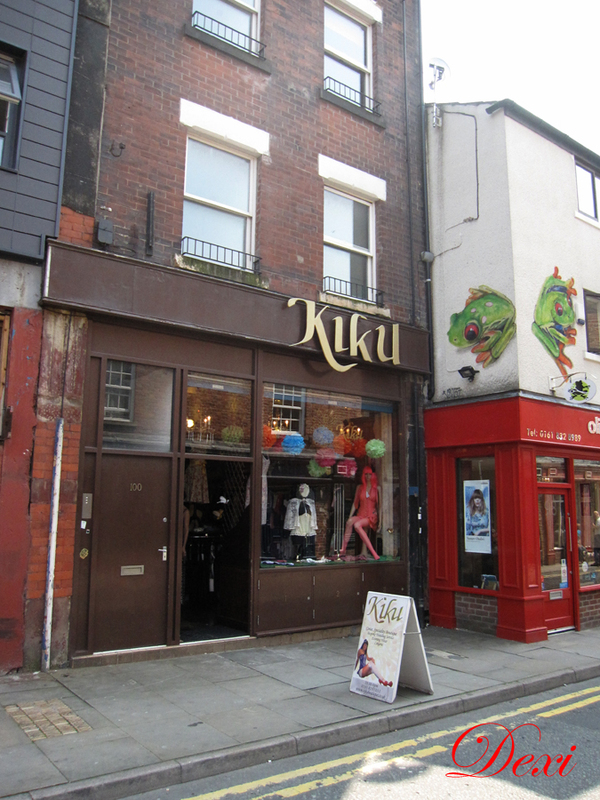 Firstly, Friday saw me heading into the Manchester city centre, more specifically to Kiku, on Tib Street in the vibrant Northern Quarter. 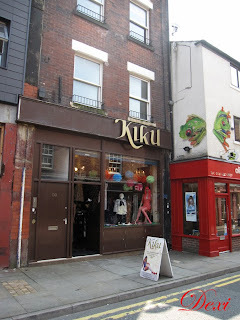 I often pop in to see what corsets and vintage-styled lingerie they have, and on my previous visit had spied an intricate Chinese-styled corset which had been specially made for a customer. 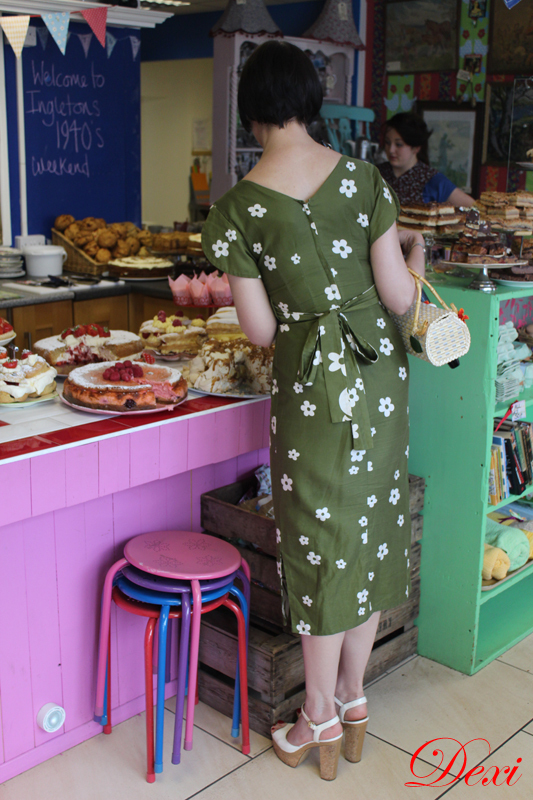 It was a very easy decision to have one made for myself, and on Friday I was due a first fitting, to make sure that the measurements and the designs I had chosen (roses, this time) were correct before the finishing touches were applied. I'm hoping to be able to collect it later this week, and already have a photo-shoot in mind! 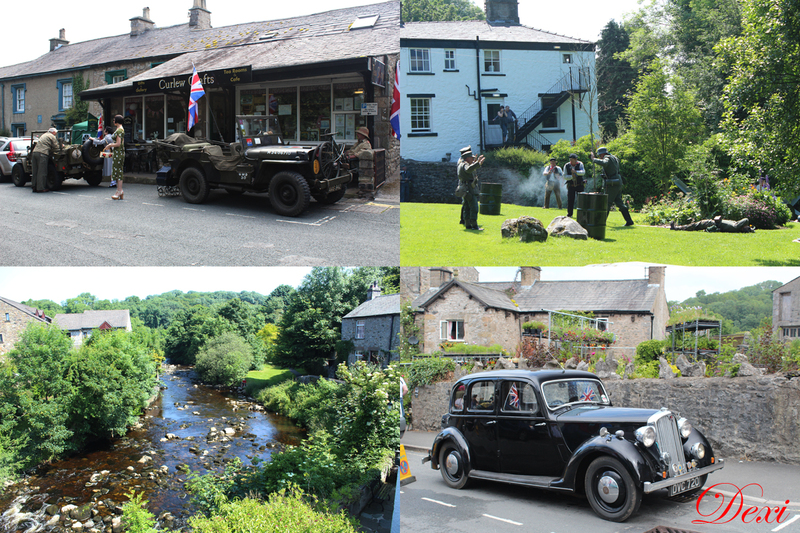 On Saturday I was up very bright and early to join friends for a trip 'ooop north', to pretty Ingleton, who were having their 1940's weekend. It was a bit cloudy on our arrival, but it didn't take too long for the sun to burn through the haze. Luckily, and in anticipation of this, I'd decided to wear the vintage Hawaiian dress that I bought at last year's Twinwood Festival. It was a fabulous day out - great outfits, great music and great weather. 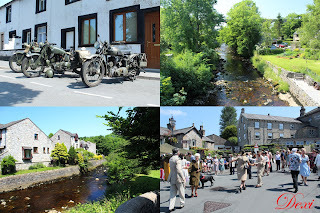 Ingleton has a little more to offer, of course. The village sits on the point where the River Twiss and River Doe meet to form the larger River Greta, and there are some lovely walks along the riverbanks around the area. 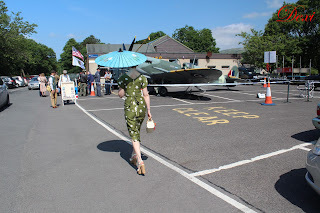 I couldn't make full use of them in my heels, unfortunately, but if I make a return visit I'll make sure I pack more suitable footwear in order to do some exploring. I made sure I was in the park for the battle re-enactment just after lunch, which saw, rather unbelievably, the French saving the day. However, I suppose it was no less believable than how Hollywood rewrites history! Special mention, however, must go to Frumenty and Fluffin, the little cake shop in the village centre that got me more excited than the clothing stalls, for once! On entering the bakery/cafe, I was confronted by the sight of gooey, sticky sweet cream cakes everywhere. I did want to strip off and dive in, rubbing the creamy sweetness all over my naked body (which would have made a glorious photo-shoot), but restrained myself enough with 'just' a piece of Raspberry and Almond Cheesecake. Sugar overload, but gorgeous nonetheless. And, speaking of nakedness (or as near-to), this week's Picture Of The Week is from the same set as last week's. A couple of weekends ago I ventured out late on Saturday night in my see-through PVC mac and see-through minidress, looking for a chance to get a couple of photos done. With the city centre predictably busy, it was out to Salford Quays to try and capture some rather risqué pictures. This was the last one, as a Police Range Rover came idling by, taking a close interest in what I was doing. So, to avoid any unwelcome attention, it was time to pack up and head home. Spoilsports! I'm back in Altrincham this week, so if this weather isn't hot enough for you and you fancy something even spicier, then you know where to head for...! "A Whore, a Whore, my Kingdom for a Whore"